Published: Aug. 2, 2011 at 11:13 a.m. 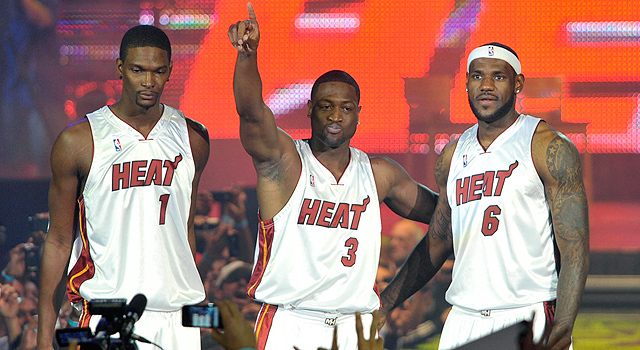 The Heat proved building a "dream team" isn't always what it's cracked up to be. Vince Young has called the current Eagles team a "dream team." Uh Vince, you might want to pump the brakes on that nickname. Not that the Eagles aren't supremely talented -- they certainly look like the favorites to win the NFC right now -- but sometimes these "greatest teams on paper" fail to work out. Sometimes trying to purchase a championship doesn't always work. Sometimes the best team that money can buy backfires. Take the 2003-04 Los Angeles Lakers with Karl Malone and Gary Payton. Or the current Miami Heat many thought were a lock for the NBA title. Or even the greatest team that money could buy yet failed to win a championship -- Michigan's Fab Five. But it is not all doom and gloom for these "dream teams." There have been a number of them that ended up winning it all. And here are the six greatest "dream teams" -- or the best teams that money can buy. The Marlins assembled a team of renegades that included Gary Sheffield, Kevin Brown, Bobby Bonilla, Moises Alou, Cliff Floyd and Darren Daulton that went on to win the 1997 World Series under the tutelage of manager Jim Leyland. This team would be more widely regarded had it not been shamelessly disbanded by ownership in the following years. The 49ers' dynasty went into decline when Steve Young replaced Joe Montana as quarterback in the early 1990s, punctuated by consecutive NFC Championship Game loses to the Dallas Cowboys in 1992 and 1993. The following year, the 49ers broke the bank to bring in big names Ken Norton Jr., Gary Plummer, Richard Dent, Rickey Jackson and, the centerpiece, Deion Sanders to win in Super Bowl XXIX. But at what cost? The 49ers have not returned to the Super Bowl since. The WWF's "Dream Team" beat the U.S. Express (Mike Rotundo and Barry Windham) for the tag-team titles (thanks to Beefcake brandishing a lit cigar to Windham's eye). They held the titles until Wrestlemania II when they were defeated by the British Bulldogs. The Dream Team challenged to Bulldogs after, but were never able to recapture the titles. The Eagles stockpiling talent almost seems strange to the NFL, given the league's revenue-sharing structure. But this would just be a typical offseason for the Red Sox and the Yankees who, since the late 1990s, have treated the rest of Major League Baseball as their personal farm system. Though the Phillies have joined in recently, so maybe the Eagles are just taking their cue from their neighbors. The Detroit Red Wings were unceremoniously bounced from the 2001 NHL playoffs by the Los Angeles Kings, which prompted the club to add Brett Hull, Luc Robitaille and Dominik Hasek to a team loaded with Hall-of-Fame-caliber players Chris Chelios, Sergei Federov, Brendan Shanahan and Steve Yzerman. The Wings beat the Hurricanes for the Stanley Cup. The United States was tired of its college all-stars losing in the Olympics so a "Dream Team" of Magic Johnson, Michael Jordan and Larry Bird (don't forget Christian Laettner) was created to show the rest of the world how to throw an elbow. Order was restored as the Dream Team crushed all would-be challengers. America! Adam Rank once paid money to see the Dream Team battle Hulk Hogan and Hillybilly Jim at the LA Sports Arena. Hit him up via Twitter or via Facebook. Oh, and be sure to catch the latest on the Dave Dameshek Football Program. "From the gridiron to the silver screen..."